Exploring Digital Print. Exhibitors of Interest at the ISA Sign Expo. The International Sign Association (ISA) throws one of the biggest parties of the year for print professionals every Spring. This March 21 to 24, 2018 the ISA Sign Expo makes its presence known in Orlando, FL at the Orange County Convention Center, South Hall. Digital print technologies for industrial applications are prevalent, from textiles to promotional materials, graphic overlays, and label and package printing. Making its debut at the show this year is the Print Fabric Pavilion where attendees can learn about the entire textile printing process and some of the tools and solutions available. This is ideal for manufacturers looking to adopt digital textile printing solutions into their workflow. Above: Gravograph showcasese the LS1000XP large format laser in booth 817. The trade show floor opens to the public on March 22, 2018. Here is a look at what vendors plan to bring to the event. Advanced Greig Laminators (AGL), booth 3827, exhibits its heavy-duty Patriot and popular Compadre laminators. The Patriot is widely used in high-volume fleet applications as well as solving problematic silvering with flatbed UV and latex printing. The Compadre complements the moderate duty needs of sign shops looking to offer roll-to-roll vehicle wraps to second surface mounting applications. Machine prices start at $13,500 and all are made in the U.S.
Agfa Graphics, booth 2611, brings its Jeti Mira HS LED with roll-to-roll and varnish capabilities. At 8.82 feet wide, the moving gantry flatbed printer is designed for optimal flexibility. Featuring print and prepare functionality; speeds up to 2,669 square feet per hour; six color, white standard, highly-pigmented Agfa-made UV inks ideal for indoor/outdoor applications; and two rows of Ricoh inkjet printheads, the Jeti Mira’s UV LED curing technology prints on heat-sensitive substrates. Alliance Technology Corporation (ATC), booth 5611, showcases two UV liquid coating machines. The ATC-80RTR roll-to-roll UV coating system is designed for precision mayer rod UV liquid coating for roll-to-roll operation. It caters to fleet graphics, wallpaper, and other roll applications. The ATC-UV36SD UV coating system provides a sheet-fed UV liquid coating solution that produces a high-quality UV coating finish on a variety of inks and substrates up to one-inch thick. AnaJet, booth 4620, invites attendees to meet the RICOH Ri 6000 direct-to-garment (DTG) printer. Imagine printing vibrant, custom graphics directly on apparel with a setup process that takes minutes, not hours. Change how your business fulfills orders with the speed to print a 12×10-inch graphic in as little as 27 seconds. See it in action, as well as the company’s brand new Ri 100, an entry-level DTG printer for under $5,000. AXYZ International, booth 2604, displays two CNC routers. The heavy-duty Pacer Series is engineered to provide the highest combination of quality and precision and offers the ideal platform for high-speed, vibration-free processing. While the Trident Series, purpose-built for sign making applications, includes a twin-knife head and heavy-duty routing spindle for taking on the broadest projects. Focusing on innovation, customization, and exceptional service, AXYZ has a CNC router to suit any project. CET Color, booth 1423, is a U.S.-based manufacturer of both UV printers and flatbed cutters. These UV printers come in both hybrid and flatbed models ranging from 63 inches to 16 feet. The company’s flatbed cutters can go up to 5×10 feet in size. Coastal PRO, booth 1846, features one of the industry’s leading turnkey textile printing solutions, the Epson SureColor F9370 dye-sublimation printer. The DGI Fabrijet 64- and 120-inch printers are also key elements of Coastal PRO’s textile manufacturing focus. These printers feature print speeds of up to 200 linear yards per hour and widths from 64 inches to ten feet wide. Coastal PRO doesn’t just sell printers—it sells the process. Colex, booth 4635, debuts the newest model in the Sharpcut Flatbed Cutter System. The Sharpcut is Colex’s most productive solution for automated finishing of wide format media. The newest model is used for a variety of applications including cutting soft to rigid boards, vinyl, fabric/textiles, foamboard, coroplast, PVC, and acrylic. It provides users with the best affordable digital cutting offering versatility, speed, and price. CutGuru, a unit of MCT, booth 4928, supports more than a thousand users of cutting tables, providing true telephone application support for blades, bits, cutting underlays/conveyor belts, and maintenance supplies. CutGuru.com provides easy ordering and quick delivery of products for all popular flatbed cutting tables. Specializing in printed graphics, CutGuru buys in volume and passes on savings to its customers. Specialty products and custom tools to specifications are also available. Epson, booth 2635, demonstrates the 64-inch Epson SureColor F9370 dye-sublimation (dye-sub) printer, which delivers proven, precise, industrial-level production with speeds up to 1,169 square feet per hour. Ideal for high-speed, economical, medium- to large-volume dye-sub transfer printing, the SureColor F9370 leverages dual PrecisionCore TFP printheads and Epson’s latest dye-sub ink technology—UltraChrome DS with High-Density Black. The printer features an integrated, highly accurate roll-to-roll media support system with advanced automatic paper-tension control and Wasatch SoftRIP TX and ICC profiles. Esko, booth 4200, promotes the Kongsberg C66, which runs at up to 100 meters per minute. It handles either manual multi-zone production of large 87×126-inch sheets or single-zone production of large 98×189-inch sheets. This makes it well suited for the production of protective packaging, and corrugated containers made from HD double-wall or triple-wall corrugated. The Kongsberg C66 also processes other materials, including foam cushioning materials. GCC, booth 3823, encourages attendees to witness the innovative GCC JF-240UV flatbed printer. It comes with high throughput, standard dual UV LED lamps, one liter bulk ink, CMYK, and optional varnish and white color to offer outstanding printing quality for short runs and on demand printing. With specially developed ADA and ink layering printing technology, the JF-240UV enables the production of various personalized and creative products in small quantities, ensuring high rates of return on investment. Gerber Technology, booth 3120, is a world leader in the development and manufacture of computerized sign making and specialty graphics systems, software, materials, and accessories. Proven start-to-finish digital design, printing, and production products are carefully integrated to provide sign shops and graphics professionals with comprehensive engineered solutions for durable vinyl cutting, digital color printing, and dimensional signage needs, as well as quality aftermarket materials. The Gerber EDGE FX design-print-cut system and aftermarket is on display in the booth. Gravograph, a brand of Gravotech Inc, booth 817, highlights it large format laser the LS1000XP and large bed rotary engraver the IS8000. The LS1000XP CO2 laser features a 48×24-inch marking area and can cut up to one-inch acrylic. The IS8000 streamlines the creation of ADA-compliant braille signage. The company also displays its material and software solutions. Leister Technologies, booth 5221, features the HEMTEK ST banner welder. The stationary welder is an efficient and affordable banner finisher. Capabilities include hem welds, pole pockets, and hems with rope. Quickly weld promotional banners or tarpaulins from corner to corner with ease. Whether sitting or standing, the HEMTEK ST can be used at almost any work table. LogoJET, booth 639, introduces its newest printer, the UVx40R, which achieves print speeds up to 33 percent faster thanks to the incorporation of industrial-strength components and three high-performance Ricoh printheads. With a customizable combination of CMYK, white, primer, and gloss inks, the UVx40R produces full color and textured imprints on a variety of substrates, up to 18×18 inches. Automatic height adjustment accommodates products up to 4.72 inches thick, and interchangeable printing trays make it easy to switch between products. Massivit 3D, booth 629, demonstrates the versatility of its large format 3D printing technology. Utilizing the flagship Massivit 1800 3D Printer, sign and display print providers can produce a range of applications, including advertising campaigns, retail displays, and bus wraps. With the ability to quickly 3D print large and complex objects, print providers add a new dimension to business, shave weeks off production methods, and enjoy greater design freedom. For intricate, customized, and repeated campaigns, print providers also have the option to 3D print moulds for vacuum forming. MCT, booth 5835, promotes its VersaTech2 all-in-one flatbed cutter for router, laser, or knife creasing with full conveying and automation for all materials. TigerVision software is improved with special compensation for stretchy fabric, an accurate jobs-longer-than-the-table capability, new quick response code job automation, and software for shaped nesting, estimating, and parametric modeling with full RIP integration is demonstrated. See also 5kW routing and laser cutting of fabric and acrylic plus etching. Mimaki USA, Inc., booth 4011, offers the UCJV Series UV LED cut-and-print devices with inline cutting capability and models featuring white ink to enable four-layer printing. Two models are available—the four-color UCJV150-160, and the UCJV300-160 to accommodate up to seven ink colors. Each produces a variety of print-and-cut applications. The four-layer printing available on the UCJV300-160 model offers an enhanced print capability allowing designers to build layered, transformative graphics for backlit applications. Mutoh America, booth 2017, announces the all new 4×8-foot UV LED flatbed printer, the PerformanceJet 2508UF, as well as other favorites from the company’s line of ValueJet printers such as the 1624X, 1948WX ultra-fast four printhead dye-sublimation printer, and the 626UF UV LED printer that is capable of printing on cylindrical items with its optional rotary attachment. Novus Imaging, part of The M&R Companies, booth 1006, shows the ULTRA 3200 large format roll-to-roll industrial inkjet printer. Designed and built in the U.S., ULTRA 3200 offers innovative features and an industry-leading price-to-performance ratio. It’s designed for multi-roll printing on substrates up to 3.2 meters wide and delivers four-color CMYK and true four-level greyscale printing. M&R’s Novus ULTRA large format dedicated UV LED flatbed printer and Novus TEXTURA 1800 large format dye-sublimation printer are also displayed. Onyx Graphics, Inc., booth 5213, focuses on its ONYX Hub software—a business intelligence tool with a browser-based dashboard that provides easy-to-understand data across a print service provider’s entire site, enabling better business decisions. It collects data by job, station, and printer, presented in real time, for immediate visibility into the shop’s production environment. With ONYX Hub software, users gain insight using trend reporting to optimize workflow and better manage business. Roland DGA Corporation, booth 4017, invites attendees to see its newest TrueVIS series eco-solvent printer/cutters, as well as advanced VersaUV flatbed printers for printing directly on unique dimensional substrates and dye-sublimation printers for textiles and hard goods. The company also showcases its popular CAMM-1 cutters, VersaEXPRESS and VersaStudio printers, and next-generation 3D mills. In addition, booth visitors can pick up useful tips at Roland’s daily live vehicle wrap, sublimation, and apparel heat transfer demonstrations. SA International (SAi), booth 2417, welcomes attendees to join the new sign.com network for increased business as well as enjoy the flexibility of software subscription as low as $19.99. Also showcased, SAi’s feature-rich Flexi and EnRoute software solutions. The company hosts free, on-stand informative workflow classes every half hour throughout the show. Summa America, booth 5438, unveils a new format of the Summa F Series flatbed system—the F1832. It offers the ability to cut roll-to-roll vinyl up to 72 inches and rigid boards in sizes up to 60×120 inches with precision. In addition, a rotary tool offers the ability to cut fabrics up to 72 inches wide. The previously announced Twin Workflow is also displayed. Supply55, Inc., booth 1413, brings its NEPATA converting equipment and Guardian dye-sublimation (dye-sub) calenders. NEPATA converting centers deliver precise material cuts and highly accurate rewinds allowing for quick delivery times across a range of media, while avoiding waste, inventory shrinkage, and roll shortage/overage problems. Guardian calenders are affordable, easy-to-use rotary heat presses for all dye-sub paper transfer and direct-to-fabric applications. swissQprint, booth 5642, presents the new Nyala LED model. On a 126×79.9-inch flatbed, Nyala LED delivers a maximum output of 2,217 square feet per hour. It is versatile when it comes to applications and thanks to cool LED curing, even heat-sensitive substrates can be printed onto easily. The Nyala LED consumes 50 percent less energy than conventional systems. Top Value Fabrics, booth 4438, exhibits its complete line of printable textiles by Georg + Otto Friedrich, including Heavy Deko-Stretch 8488GFS. Heavy Deko-Stretch is a market-leading solution for event and retail applications where a stretch fit is required. This fabric is engineered with equal four-way stretch in width and length. The resulting dimensional stability alleviates installation issues traditionally associated with stretch fabrics since the fabric doesn’t wrinkle or skew after installation. Trotec, booth 2024, demonstrates the SP2000 laser cutter for large format materials. Built for efficient production, the laser safety class 2 system offers functionality that translates into competitive advantages—including processing speeds up to 6.5 feet per second, laser power up to 400 watts, and a working area of 66×98 inches. X-Rite and IT Supplies, booth 2845, showcase solutions to help wide format printers match color from device to device, substrates, inks, and coatings. Experts discuss best practices for managing color from design through prepress, production, and quality assurance. Demonstrations of PantoneLIVE—a cloud-based solution for digital color specification, i1 Display for on-screen color accuracy, eXact handheld spectrophotometer, and ColorCert software to manage CMYK, Expanded Gamut, and Spot Color workflows are held. Zünd, booth 5030, exhibits the Zünd LM 100W cut and seal Laser Module developed for no-fray cutting and finishing of polyester fabrics. Other highlights specifically designed for industrial print service providers aiming for superior productivity include the latest Zünd Cut Center ZCC 3.0 features, such as the OCC Over-Cutter Camera system and Dashboard, as well as the high-powered 3.6kW routing system with automatic tool/bit changer. 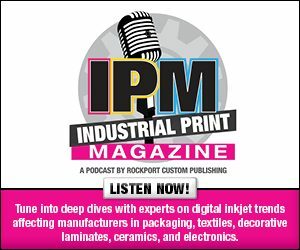 Industrial Print magazine is in booth 5906 with its sister publication, Digital Output. Be sure to stop by and say hi, or pick up a copy of this issue.